SnapSort does only one thing but does it very well. 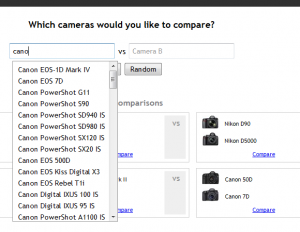 It lets you compare specs for digital cameras side by side. Start by going to SnapSort and typing in the name of any camera. As soon as you start typing, the auto-suggest feature will make it super easy for you to select the camera you want to compare. Once you have selected the two desired cameras, SnapSort will compare them with each other and tell you which one is the winner. It will start by pointing out important differences and then continue to list the important similarities. This will be followed by Pros and Cons for each camera and the detailed specifications of each including supported features and type of technology used. SnapSort also provides 3 images of each camera so you can also compare them visually. 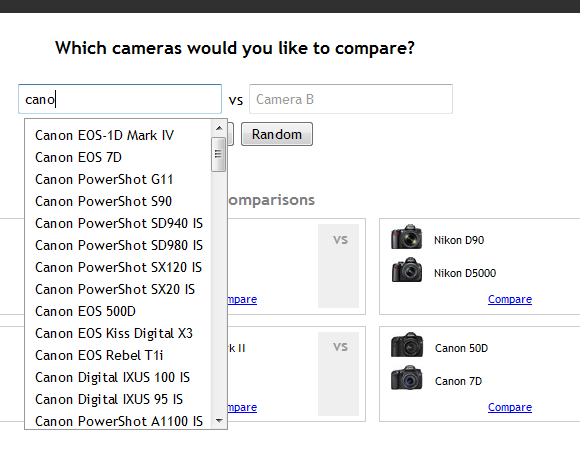 You can also view popular comparisons for each camera or compare two random cameras. Compare any two cameras with a single click. Find out important differences and similarities. View pros and cons for each camera. See which camera is better for you and why. This entry was posted in Photo Equipment and tagged Comparison, Digital Cameras, Gadgets, Photography by aircraftplanet. Bookmark the permalink.